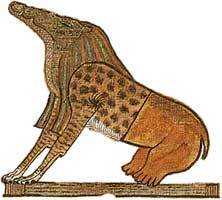 Ammut was a creature which dwelled in the Hall of Ma'at awaiting the judgement of the deceased that passed through there. Those souls who were found unworthy to dwell in the Afterlife were devoured by her. The process of judgement involved the weighing of the deceased person's heart against the feather of Ma'at. If the heart (the seat of the soul, according to the ancient Egyptians) was found to be heavy with sin and impurities and did not balance with the feather, Ammut would devour them. The goddess was depicted with the head of a crocodile, the forequarters of a lion, and the hindquarters of a hippopotamus.